Join our faculty in addressing fundamental issues of redox biology that impact biological processes in bacteria, fungi, plants, and animals! 2018 Redox Biology REU students. 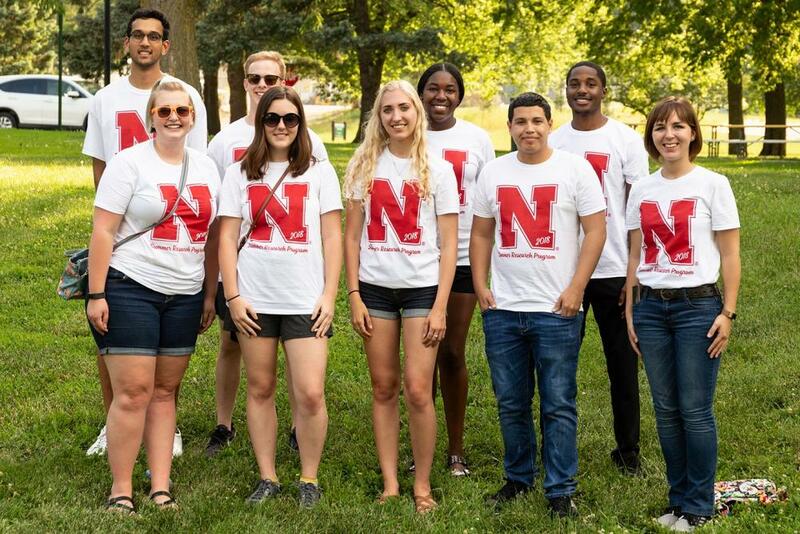 The Redox Biology Center Summer REU Training Program at the University of Nebraska-Lincoln was established in 2006 by the National Science Foundation to carry out independent research projects in redox biochemistry. Research areas range from molecular medicine to environmental biochemistry and plant biochemistry. REU students participate in exciting projects at the cutting edge of research in redox biology. They formulate and test hypotheses, develop experimental problem-solving skills, and receive training in biochemical, biophysical and molecular biology techniques. Students are also exposed to a variety of instrumentation such as HPLC and FPLC systems, EPR spectroscopy, mass spectroscopy and microscopy which are located in the interdisciplinary Beadle Center. 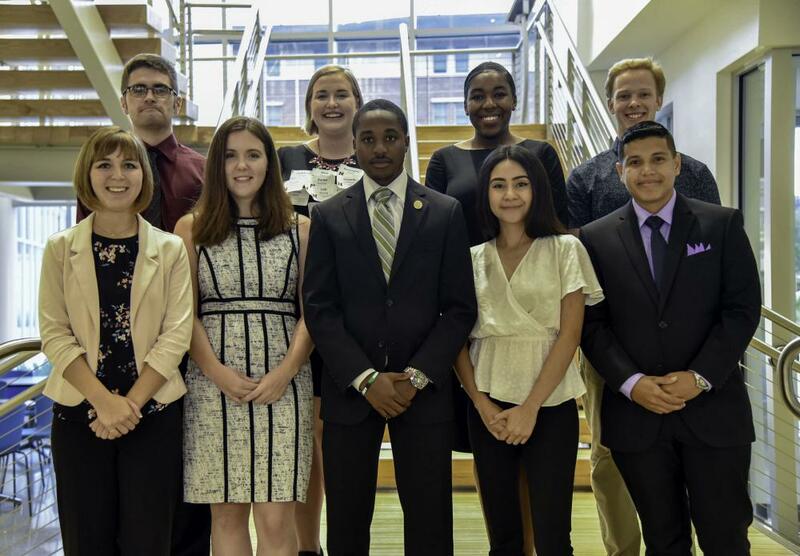 Individual projects are designed to be completed within the ten-week time frame of the summer program. The projects generally fit into the larger context of the faculty advisor's research program. 2018 Redox Biology REU students at the end-of-year banquet. Students are placed with a faculty mentor in whose lab the student's research project will be pursued and students are expected to participate fully in the life of the mentor's lab. There are informal meetings for all program participants which facilitate the exchange of information on the research being conducted. There are also weekly meetings in which various scientists describe the latest advances in their own research or career opportunities in biomedical or biotechnology fields. These events provide an opportunity to discuss areas of biochemistry/redox biology that are of particular interest and excitement. The ten-week summer program is sponsored by the National Science Foundation. Proteomics and metabolomics approaches to identify specific molecular pathways of cellular response to various forms of stress. Pathogenic strategies employed by bacteria to cause plant diseases focusing on the type III protein secretion system and the bacterial virulence proteins it injects into host cells. Redox homeostasis and metabolic analysis in Mycobacterium tuberculosis latency. Redox regulatory mechanisms, protein structure-function relationships and proline metabolism. Molecular mechanism for biosynthesis and regulation of bioactive natural products including antibiotics and mycotoxins. Oxidative stress and neuronal cell death in neurodegenerative diseases. Mitochondrial Homeostasis: Biogenesis of Redox-Active Compounds and Mechanisms of Quality Control and Protection. Metal ion transporters, implication of trace elements in metabolic and degenerative disease, cellular stress response. Cellular and molecular mechanisms underlying the development of human autoimmune diseases. Research group focuses on nutrient sensing and metabolic signaling in obesity and cancer. The major focus of current research is to understand how Sestrins and autophagy are involved in the initiation and development of metabolic syndrome under environmental and genotoxic stresses. Elucidation of mechanisms by which Staphylococcus aureus controls virulence factor production in response to nutrient limitation. Molecular mechanisms and regulation of programmed cell death (PCD) in plants, the role of PCD in plant development and response to pathogens and signal transduction. Structural biology of proteins involved in neurodegenerative diseases. Structure-function relationships of proteins involved in antibiotic resistance and stress response.